The Sign Studio not only offers custom designed signs and banners, but also sign repair and installation, sign removal and even sign site surveys to ensure your sign will get the most exposure. 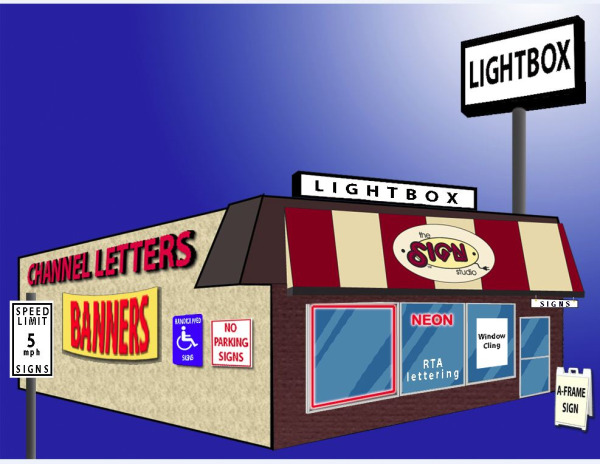 The Sign Studio will even design a logo for the sign to stand out and represent the company in its brightest light. The highest technology is used to create these high impact, cost effective signs to boost business. The Sign Studio produces indoor and outdoor signs as well as illuminated and non-illuminated signage of all kinds. The team at The Sign Studio promises to make your journey to a successful business easy. We begin by developing a cost effective design and logo. Each client is considered a friend in this journey. As the projects blossom from paper to reality each sign is fabricated with the highest technology possible. If you have any questions or need assistance with anything, please give us a call at The Sign Studio - (818) 843-9200 or send us an e-mail at thesignstudio@sbcglobal.net.